A killer traps an unarmed police detective and her husband, a former mountaineer with psychic powers, in a Manhattan office building. A woman is stalked by a psychotic killer. She eventually kills him, only for the man to shows up again, this time sane and without any knowledge of the attacks. The police doesn't believe her, but one detective agrees to look into it. A man and his stepson driving across Europe are terrorized by a man following them in a pickup truck. When a new and dangerous "Outsider" chases an intelligent golden retriever in the South American jungles, Terror grips a team of ex-Military convicts sent to capture the creature. 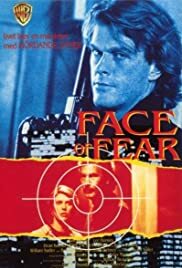 "The Face of Fear" is one of the best television movies I've ever seen. The underrated Kevin Conroy (best known as the voice of the animated Batman) plays one intense and psychotic serial killer. It's great to watch his character go from calm and laid-back to burning mad with frustration as his intended victims - a psyhic (Lee Horsely) and his assistant (Pam Dawber) - continue to stay one step ahead of him as he stalks them throughout the empty skyscraper where they're working. The other actors give solid performances as well, but Conroy is the stand-out talent in this flick. Chase scenes and occasional physical encounters all lead to a thrilling climax as Horsely and Dawber attempt to scale the side of the building in their desperate attempt to reach the streets below, and safety. Great score by John Debney, too. Check it out next time to see it listed!